Archive from category "Cincinnati Roofing"
Chimney Crowns and caps are an important functional component of your home. They stop rain water from pooling and soaking into your home’s structural components. Without properly functioning chimney crowns, your home and finances will be in big trouble. We’ve found that leaky chimney crowns caused by rust, wear and tear, and weather damage can lead to serious problems for home owners. We’ve also found leaky chimney crowns can be prevented by consistently checking them. 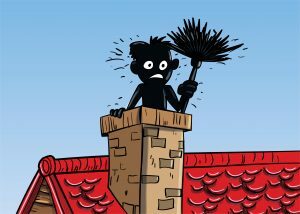 You should have your crowns and caps checked by a trained chimney sweep every time that you have your chimney cleaned, which is at least once a year. Gutters can be clogged by tree branches, leaves, and/or dirt. Before testing you gutters for leaks, you must remove any and all of the above mentioned elements so that testing can be done properly. It’s neither the easiest nor cleanest jobs, but it most be done. Use a ladder to access the top of your gutters. Cover your hands with yard gloves, and scoop all debris until the gutters are clear. This is best done with two people. Ideally, you want to bring the garden hose up the ladder while the water is not running. The garden hose should be placed in the gutter and your helper should turn it on. You or your helper should hold the hose in place while the other inspects the gutters and the house’s perimeter for any leaking water. Notes should be taken to ensure you know exactly where any and all leaks are. Once you’re done one section of gutters, move on to the next. Repeat this process until all sections of your gutters are checked. When finished, you should have a comprehensive list of all leaks and their locations. Having a leak isn’t really a big deal. Not fixing it is. First, try to patch it with roofing cement or a metal/aluminum (*this is determined by what your gutters are made of) patch kit. Most leaks can be easily fixed in this manner. If a patch doesn’t work because too much is damaged, it’s time to replace the gutter. Replacement can be done in part or entirety. This depends on how much of the gutter is actually damaged. For a partial replacement, simply cut the damaged gutter and replace it with a new one of appropriate size and length. For a total replacement, simply remove the gutter and replace it with a new one of appropriate size and length. Make sure that the gutter is working properly by checking it as described above. If for any reason you aren’t comfortable with doing any of the above-mentioned tasks, you can always contact an experienced chimney sweep and gutter service company to do them for you. Checking your gutters and chimney might cost you some time and money, but it’s definitely worth it. Let us sweep you off of your feet! Or email us at bestcincinnatichimney@gmail. or click here to schedule an estimate. What are Chimney Caps and Why Do You Need One? © 2018. Best Cincinnati Chimney, all rights reserved.